Sri Ram Raksha Stotra (Sanskrit: श्रीरामरक्षास्तोत्रम् Hindi: श्रीरामरक्षास्तोत्र) is one of the most powerful divine hymns (Sanskrit Stotra) in praise of Lord Sri Ram, recited as a prayer, and a request for the complete protection from Lord Rama. Vaidic Sage Budha kaushika was imparted this stotra (hymn of praise) in his dream by Lord Shiva, and was ordered by him to compose this hymn, and in the same way after awaking in the morning sage Budhakaushika noted it down. Thus, this hymn has a divine origin. There is also a reference to this divine hymn in Rig-Veda. 'Ram Raksha' literally means 'Bhagavan Sri Rama's protection (to us)'. Sri Ramaraksha Stotra is also called Rama-Kavach, a shield of Protection by Lord Sri Rama, It is Sri Ram's armour called Vajrapanjar (वज्रपञ्जरनामेदं). Whoever sincerely recites with all faith in Sri Rama, keeping its true meaning in heart, he not only gets the protection from Sri Rama, but also everything Bhakti, Mukti, and all the prosperity and powers at his beck and call, he prospers in this world, and attains salvation in the end. Thus this hymn, in itself, is a complete prayer to Sri Rama and recited with all faith and love by millions of devout Hindus and Sri Ram-Bhaktas every morning and on especial occasions such as Ramanavami, Navaratri etc. During Chaitra-Navaratri and Ashvin-Navaratri, one should recite Ramarakshastotra at least 12 times daily morning in Brahm-muhurtam (just before sun-rise) for all 9 days, keeping the true meaning of stotra in heart while reciting it. Shri Ram is the Purusa (the most superior personality) of Vedas and the Brahman (the supreme absolute entity) of Upanishas. Sri Ram is eulogized as Purusa, Vishnu, Indra (in the sense of the supreme king of the cosmos at many places) in all the Vedas. Translation: O' human beings! 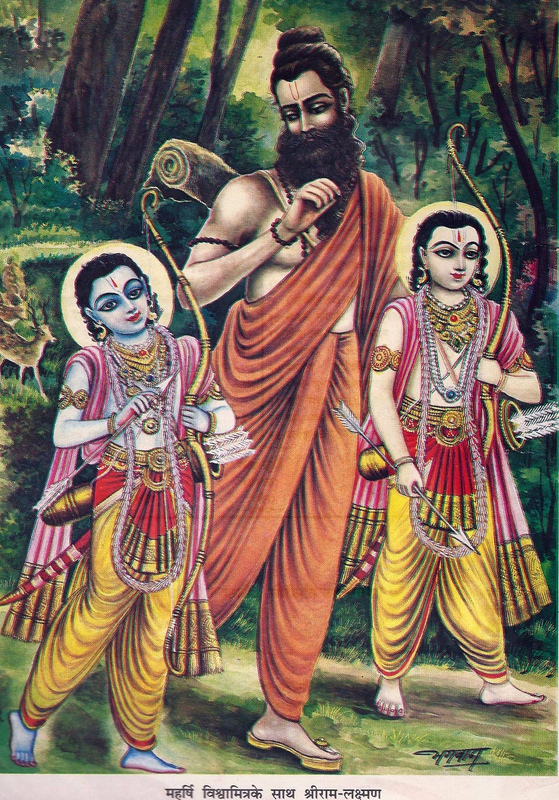 I (Vishvamitra) have sung praises to lord Shri Rama (Indra) in form of Ram-Raksha-Stotra. That Rama (Indra) is Brahman (the supreme absolute element) the sustainer of this earth and heaven! May this prayer (Ram-Raksha-Stotra) of Vishvamitra keeps secure the race (people) of Bhaarata. 1) Here Sri Ram is called Brahman the supreme personality, the sustainer of heaven and earth. 2) Every devotee of Sri Ram should pray Rama-Raksha-Stotra daily. Sri Ram will take care of his/her Yog-Kshemam (well-being). Now in next Hymn of Rig Veda i.e. Rig Veda 3.53.13, Vishvmitra gives Bala and Ati-Bala Vidya (the knowledge of Bala and Ati-Bala Mantras) to Sri Rama. The hymns of Bala and Ati-Bala are explained in this chapter of Rig-Veda 3.53. This episode of giving Bala and Ati-Bala Vidya to lord Ram is also there in Valmiki RamayaNa, in fact Valmiki RamayaNa was written in order to reinforce the real imports of Vedas (veda upa bR^imhaNa arthaya - Valmiki RamayaNa 1.4.6). Specific hymns of Bala-Atibala Vidya are Rig-Veda 3.53.17, 18, 19, 20, and 21. Thus Shri Ram Raksha Stotra has vedic origin. As like Sri Ram is the most attractive and also the ultimate refuge, similarly Sri Ram Naam is the most beautiful and the best among all mantras in giving protection. 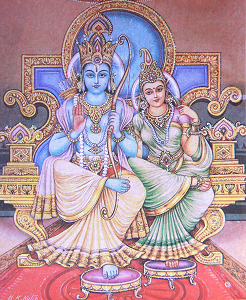 Sri Ram Raksha stotra is also the song of supreme glory of Sri Rama Naam. Sri Ram Raksha stotra has many beautiful names of Shri Ram, so it is very much pleasing and nectarine to heart and mind for recitation. It is a pure bliss to keep the nectar in the from of the beautiful names of Shri Rama on tongue while recitation and to contemplate over it. Some beautiful names of Shri Rama coming in this hymn are : Sri Rama, Rambhadra (Sri Rama, the most virtuous), Ramchandra (Shri Rama whose countenance is like full moon), Raghav, Raghunandan (the darling of Raghus), Raghunath (the lord of Raghus), Dashrathatmaj (the son of Dashrath), Kaushalyey (the son of Kaushalya), Vishwamitrapriy (favorite to Vishwamitra), Saumitri-vatsal (affectionate to Lakshman), Sitapati (the consort of Sita), Jamadagnyajit (the conqueror of the son of Jamdagni), Bharatvandit (saluted by Bharat), Vidyanidhi (the ocean of wisdom), Khardhvansi (the destroyer of demon Khara), Jambvadashray (in whom Jambvan takes refuge), Sugrivesh (the lord of Sugriva), Hanumatprabhu (the god of Hanuman Ji), Raghuttama (the best of Raghus), Dashrathih (the son of Dashrath), Kakutsth (the scion of Raghus), Bharatagraj (the elder of Bharat) Purush (Supreme Purusha of Vedas), Purna (the complete, the absolute one), Janakivallabh (the dearest [Vallabh] of Janaki), Puran-Purushottam (the Purushottama renowned in scriptures), etc. Each name of Shri Rama is so beautiful in Sri Ram Raksha Stotra, which makes this hymn a treasure of the sweet names of Shri Ram, so everyone should recite it daily to drink the pure nectar in form of sweet names of dear lord. Shri Ram Raksha Stotra gives a very beautiful and unique verse dedicated for surrendering into lotus feet of Bhagavan Shri Rama. 'Sarvabhāvēna śaraṇāgati ' into supreme Purusha Sri Rama is the conclusion of Ramayana as well as Gita, Shri Rama Raksha Stotra also sings for the Sarvbhaven Sharanagati (taking Sharanagati of lord with whole heart). So here one pledges and takes sharanagati (refuge) of Bhagavan Shri Rama with whole heart. It is for experiencing Shri Rama all the time. if one is not able to fix his/her heart in any one of the relations with Shri Ram, so s/he should take Sharanagati (refuge) of lord with Sarva-Bhavas - this is the complete meaning of Gita 18.62. श्री रामजी ने कहा- हे सखा! सुनो, माता, पिता, भाई, पुत्र, स्त्री, शरीर, धन, घर, मित्र और परिवार - इन सबके ममत्व रूपी तागों को बटोरकर और उन सबकी एक डोरी बनाकर उसके द्वारा जो अपने मन को मेरे चरणों में बाँध देता है। (सारे सांसारिक संबंधों का केंद्र मुझे बना लेता है), जो समदर्शी है, जिसे कुछ इच्छा नहीं है और जिसके मन में हर्ष, शोक और भय नहीं है! ऐसा सज्जन-भक्त मेरे हृदय में कैसे बसता है, जैसे लोभी के हृदय में धन बसा करता है! A saint of this description abides in My heart even as mammon resides in the heart of a covetous man. Shri Ram Raksha Stotra removes all the dangers and obstacles, and It bestows everything Bhakti, Mukti, protection, and Sarv-Samprada (divine as well as material)! 1) Bhakti [devotion of Sri Sri SitaRama] , 2) Mukti [supreme liberation] , 3) Bhukti [all enjoyments in this world] 4) Accomplishments [Gets all powers andl Siddhis] , 5) Shiled of protection (Raksha) from Shri Ram himself against all types of fears and obstacles, 6) Victory (success) and auspiciousness everywhere [Jay-mangalam] , 6) Long life (Chirayu) , 7) Happiness (becomes blessed) [Sukhi] , 8) Humility [becomes Vinayi], 9) children and good family, 10) all sorts of wealth [both divine and material wealth], etc. There are 4 lines, and every line has nineteen syllables. All four pādas (lines) follow the same pattern. śārdūla means the lion, and lion is renowned as the king of forest. Therefore, While saluting Shri Rama in the beginning of Shri Ramacharitmanas, Goswami Ji composed the shloka in same śārdūlavikrīḍitam meter to present his Ishta-deva Shri Rama is the king among all Bhagavad-swarupas. śārdūlavikrīḍitam meter is a very auspicious meter, poets like to express their best wishes to couple in especially śārdūlavikrīḍitam meter, when the marriage ceremony is being performed, while couples put garlands on each other. There are many other secret features of Shri Ram Raksha Stotra. (the hymn of Lord Rama for complete protection). The author of this hymn is Budhakaushika Rishi. The deity is Sri Sri Sita-Ramachandra. The meter is Anushtup [eight syllables in a quarter]. Power (energy of mother nature) is Sita. The usage is recitation for pleasing Lord Sita-Ramachandra [Yugal Brahman]. I meditate on Bhagavan Shri Ramachandra who has long arms reaching his knees, who is holding a bow [Sharnga] and arrows, who is seated in a lotus pose, who is wearing yellow clothes, whose eyes compete with petals of a fresh lotus, who looks contented, Whose sight is fixed on the lotus face of Sita, sitting on his left thigh, whose color is like that of rain cloud, Who shines in various ornaments and has matted hair which can reach till thighs. Thus meditated (on Sri Sri SitaRama). Shri Rama who is tormentor of his enemies in the war. I remember the feet of Sri Ramachandra in my mind. I praise the feet of Sri Ramachandra by my speech. I salute the feet of Sri Ramachandra by bowing down my head. My Swami (lord, master, husband) is Shri Rama, My dearest friend is Ramachandra. Indeed the kind-hearted Shri Rama is all I have!